This is a strange one, I'm not going to lie. It's a tough read but it's one that I feel that is really worth it. We need to talk about Kevin is narrated by a mother, in a series of letters to her estranged husband, after her son, shortly before turning sixteen, goes into his school and shoots dead nine people. The mother, Eva, writes to her husband, about Kevin's upbringing, their relationship and how it ended up the way it has. It's a harrowing read, very tense but most of all, it really does make you think. About the influence a parent has on your life, whether people who commit crimes like Kevin did, are born with that type of mind or are deeply affected by things that occur in their life and about the degree to which a parent can be blamed for that kind of crime. I can't say I loved this book, but I don't think anyone could with the subject matter, but I have found myself thinking about it since finishing it and in my opinion, that's the sign of a fantastically written novel. Lindsey Kelk is just fabulous. She is the queen of chick lit and I refuse to believe anything otherwise. My absolute favourite series of hers is with the character Tess, and the new book is out in November - I am so so excited! Anyway. Always the bridesmaid is just hilarious, as we are taken on quite a crazy journey with Maddie, and her two best friends, Lauren(who is getting married) and Sarah(who is getting divorced). 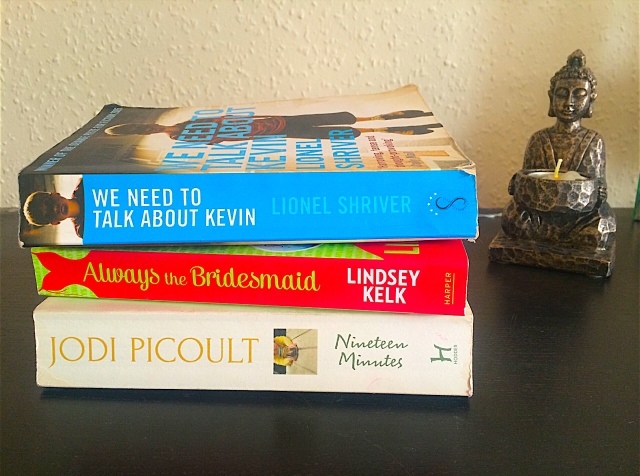 An interesting combo... What I love about Lindsey Kelk's books, is that you aren't taken on a perfect journey of a perfect person who falls in love with the perfect guy. Instead, it's real life, with characters that you can genuinely relate too(which sometimes isn't the best thing). A funny, easy to read novel, which would be perfect to keep you company on the beach this summer. Nineteen minutes is, similarly to We need to talk about Kevin, a book surrounding the actions of a boy who went into his own school and shot dead ten people. Contrastingly though, the perspective is from a range of different characters, including the daughter of the Judge of the case, who despite not remembering what happened, has the answers which unlock the mystery of what happened on that dramatic day. The main difference from We need to talk about Kevin, in my opinion, is the mother of the killer this time, who is very very different and really got me thinking about how when a tragedy like this unfortunately occurs, the media are very quick to blame the parents, and how at times, this is very unfair. Nineteen minutes explores a very sensitive topic, but Jodi Picoult really does write superbly. Thought provoking, sad but completely impossible to put down. Reading both We need to talk about Kevin and Nineteen minutes shortly before the tragedy that occurred in South Carolina last week really made me think just how close these novels were to real life. I will never understand the gun law in America, and I hope that one day in the future, hopefully sooner rather than later, the laws are changed so these tragedies don't continue to happen, on such an awfully frequent basis.